Cloud connected devices have many benefits. They can use online conversion services, host job queues while the device is offline, and be accessible from anywhere in the world. However, with many cloud devices accessible by a given user, we need to provide a method for finding the nearest device based on location. The purpose of the Privet protocol is to bind the flexibility of cloud devices with a suitable local discovery mechanism so that devices are easily discovered in new environments. The Privet protocol consists of 2 main parts: discovery and API. 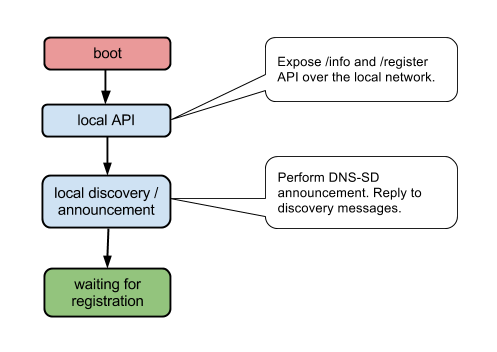 Discovery is used to find the device on the local network, and the API is used to get information about the device and perform some actions. Throughout this document, the device refers to a cloud connected device implementing the Privet protocol. Discovery is a zeroconf based (mDNS + DNS-SD) protocol. The device MUST implement IPv4 Link-Local Addressing. The device MUST comply with the mDNS and DNS-SD specs. The device MUST perform name conflict resolution according to the above specifications. The device can implement other service types as well. It is advised to use the same service instance name for all service types implemented by the device. For example: a printer may implement "Printer XYZ._privet._tcp" and "Printer XYZ._printer._tcp" services. It will simplify setup for the user. However, Privet clients will look only for "_privet._tcp". The DNS Service Discovery defines fields to add optional information about a service in the TXT records. A TXT record consists of key/value pairs. Each key/value pair starts from the length byte followed by up to 255 bytes of text. The key is the text before the first ‘=’ character and the value is the text after the first ‘=’ character until the end. The specification allows for no value in the record, in such case the will be no ‘=’ character OR no text after the ‘=’ character. (See DNS-SD spec: "6.1. General Format Rules for DNS TXT Records" for the DNS TXT record format and "6.2. DNS-SD TXT Record Size" for the recommended length). Privet requires the device to send the following key/value pairs in the TXT record. Key/Value strings are case-insensitive, for example "CS=online" and "cs=ONLINE" are the same. Information in the TXT record MUST be the same as accessible through /info API (see 4.1. API section). It is recommended to keep TXT record size under 512 bytes. Version of the TXT structure. txtvers MUST be the first record of the TXT structure. Currently the only supported version is 1. Note: This is an optional key and may be skipped. However, if present, user SHOULD be able to modify this value. The same description MUST be used when registering device. Comma-separated list of device subtypes supported by this device. Format is: "type=_subtype1,_subtype2". Currently, the only supported device subtype is printer. Each subtype listed should be advertised using a corresponding PTR record. For each supported service subtype, there should be one corresponding item. Service subtype name (<subtype>._sub._privet._tcp) should be equal to device type here. Indicates the device’s current connection state. Four possible values are defined in this spec. "online" indicates that the device is currently connected to the cloud. "offline" indicates that the device is available on the local network, but can’t talk to the server. "connecting" indicates that the device is performing its startup sequence and is not fully online yet. "not-configured" indicates that the device’s internet access has not been configured yet. This value is not currently used, but may be useful in future versions of the specification. If the device has been registered with a cloud, on startup it should check connectivity with a server to detect its connection state (for example, calling cloud API to get device settings). The device may use its notifications channel (e.g. XMPP) connection state to report this value. Unregistered devices on startup may ping a domain in order to detect their connection state (for example, ping www.google.com for cloud print devices). On device startup, shutdown or state change, the device MUST perform the announcement step as described in the mDNS specification. It SHOULD send the corresponding announcement at least twice with at least a one-second interval between them. On device startup it MUST perform probing and announcing steps as described in the mDNS specification. SRV, PTR and TXT records should be sent in this case. It is recommended to group all records into one DNS response if possible. If not, the following order is recommended: SRV, PTR, TXT records. On device shutdown it SHOULD try to notify all interested parties about it by sending a "goodbye packet" with TTL=0 (as described in mDNS documentation). In case of any information described in TXT has changed, the device MUST send an update announcement. It is enough to only send the new TXT record in this case. For example, after a device is registered, it MUST send an update announcement including the new device id. After a cloud device has been discovered, client communication is enabled with the device directly over the local network. All APIs are HTTP 1.1 based. Data formats are JSON based. API requests may be GET or POST requests. HTTP/1.1 400 Missing X-Privet-Token header. If "X-Privet-Token" header is empty or invalid, the device MUST respond with "invalid X-Privet-Token error" (invalid_x_privet_token, see Errors section for details). The only exception is the /info API. To see more info on why this is done and how tokens should be generated, see Appendix A: XSSI and XSRF attacks and prevention. If a requested API does not exist or is not supported, the device MUST return an HTTP 404 error. 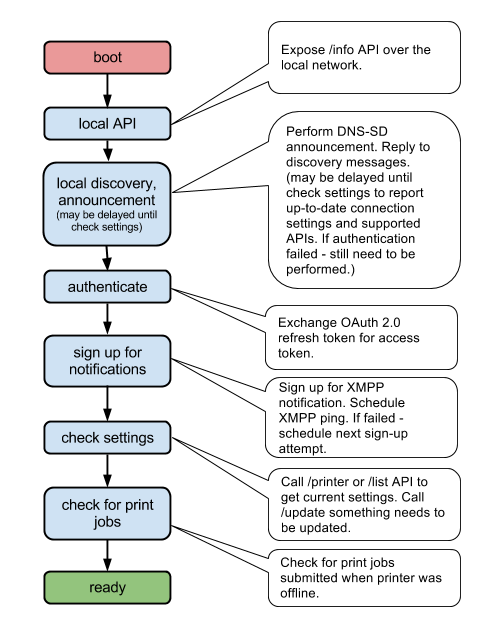 Before ANY API is exposed (including the /info API), the device MUST contact the server to check local settings. Local settings MUST be preserved between restarts. If the server is not available, the last known local settings should be used. If the device has not been registered yet, it should follow the default settings. Cloud Print devices MUST follow the steps below to register, receive and update local settings. local_discovery boolean Indicates if local discovery functionality is allowed. If "false", all local API (including /info) and DNS-SD discovery must be disabled. By default, newly registering devices should pass "true". access_token_enabled boolean (optional) Indicates if /accesstoken API should be exposed on the local network. By default should be "true". printer/local_printing_enabled boolean (optional) Indicates if local printing functionality (/printer/createjob, /printer/submitdoc, /printer/jobstate) should be exposed on the local network. By default should be "true". printer/conversion_printing_enabled boolean (optional) Indicates if local printing may send job to server for conversion. Only makes sense when local printing is enabled. xmpp_timeout_value int (optional) Indicates the number of seconds between XMPP channel pings. By default MUST be 300 (5 minutes) or more. Important: The lack of any optional value indicates that the corresponding functionality is completely unsupported by the device. /cloudprint/printer is preferred over /cloudprint/list, but both will work. "current" object indicates settings that are in effect at the moment. "pending" object indicates settings that should be applied to the device (this object may be missing). Once the device sees "pending" settings, it MUST update its state (see below). Once the device sees "pending" section as a result of the /cloudprint/printer API (at startup or due to the notification), it MUST update its internal state to remember the new settings. It MUST call the server API to confirm the new settings. For Cloud Printers, the device MUST call /cloudprint/update API and use "local_settings" parameter as during registration. When re-connecting to XMPP channel, the device MUST call /cloudprint/printer API to check if local settings has been changed since the last time. "local_settings" parameter that device uses to call server API MUST NEVER contain "pending" section. ONLY the device can change the "current" section of the "local_settings". Everybody else will change the "pending" section, and wait until changes get propagated to the "current" section by the device. When unable to contact the server during startup, after notification, device MUST use last known local settings. The device MUST receive a successful HTTP answer with success=false and no device/printer description. It means device has been removed from the server, and the device MUST erase its credentials and go to default factory settings mode. ANY time the device receives a reply indicating it has been deleted as a result of the /cloudprint/printer API (startup, update settings notification, daily ping), it MUST delete its credentials and go to default mode. The info API returns basic information about a device and functionality it supports. This API MUST never change the device status or perform any action, since it is vulnerable to XSRF attacks. This is the ONLY API allowed to have an empty "X-Privet-Token" header. Clients should call /privet/info API with "X-Privet-Token" header set to X-Privet-Token: ""
The info API MUST return data consistent with data available in the TXT record during discovery. /privet/info API has no input parameters. /privet/info API returns basic information about device and supported functionality. The TXT column indicates the corresponding field in the DNS-SD TXT record. device_state string State of the device. (optional) We strongly recommend using the same serial number ID everywhere, so different clients can identify the same device. For example, printers implementing IPP may use this serial number ID in "printer-device-id" field. uptime int Number of seconds from the device boot. x-privet-token string Value of the X-Privet-Token header that has to be passed to all APIs to prevent XSSI and XSRF attacks. See 6.1. for details. semantic_state JSON (optional) Semantic state of the device in CloudDeviceState format. /privet/register - API for device registration over the local network. (see /privet/register API for details). This API MUST be hidden once the device is successfully registered in the cloud. /privet/accesstoken - API to request access token from the device (see /privet/accesstoken API for details). /privet/capabilities - API to retrieve device capabilities (see /privet/capabilities API for details). /privet/printer/* - API specific to the device type "printer", see printer specific APIs for details. When the device is turned on (or after clicking a special button on the device) and has not been registered yet, it should expose the /privet/register API to allow a user from the local network to claim the printer. After registration is complete, the device should stop exposing the /privet/register API to prevent another user on the local network from reclaiming the device. 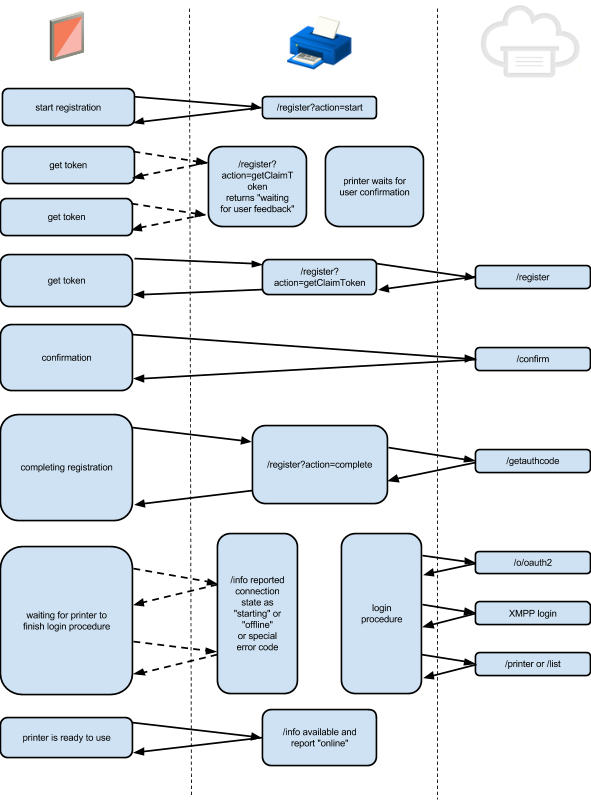 Some devices may have different ways to register devices and should not expose the /privet/register API at all (for example, Chrome Cloud Print connector). The registration process consists of 3 steps (see anonymous registration for Cloud Print). A client initiates this process by calling the /privet/register API. The device may wait for user confirmation at that time. If this is the same user who started registration - drop all previous data (if any) and start a new registration process. If this is different user - return device_busy error and 30 seconds timeout. After the client has claimed the device, the client should notify the device to complete registration. Once the registration process is complete, the device should send an update announcement, including the newly acquired device id. Note: When the device is processing a /privet/register API call, no other /privet/register API calls may be processed simultaneously. The device MUST return the device_busy error and 30 seconds timeout. User confirmation for registration on the device is HIGHLY recommended. If implemented, the device MUST wait for user confirmation AFTER it receives a /privet/register?action=start API call. The client will be calling /privet/register?action=getClaimToken API to find out when user confirmation is complete and claim token is available. If the user cancels registration on the device (e.g. presses the Cancel button), the user_cancel error MUST be returned. If the user has not confirmed registration within a certain timeframe, the confirmation_timeout error MUST be returned. See defaults section for more details. user Email of the user who will claim this device. The device MUST check that the email address from all actions (start, getClaimToken, cancel, complete) matches. action string Same action as in input parameter. user string (optional) Same user as in input parameter (may be missing, if omitted in the input). token string (optional) Registration token (mandatory for "getClaimToken" response, omitted for "start", "complete", "cancel"). claim_url string (optional) Registration URL (mandatory for "getClaimToken" response, omitted for "start", "complete", "cancel"). For Cloud Printers it must be the "complete_invite_url" received from the server. automated_claim_url string (optional) Registration URL (mandatory for "getClaimToken" response, omitted for "start", "complete", "cancel"). For Cloud Printers it must be the "automated_invite_url" received from the server. device_id string (optional) New device id (omitted for "start" response, mandatory for "complete"). The device MUST return its device id in the /privet/info API response ONLY after registration is complete. device_busy The device is busy and can’t perform the requested action. Retry after timeout. pending_user_action In response to "getClaimToken" this error indicates that the device is still pending user confirmation, and "getClaimToken" request should be retried after timeout. user_cancel User explicitly cancelled registration process from the device. confirmation_timeout User confirmation times out. invalid_action Invalid action is called. For example, if client called action=complete before calling action=start and action=getClaimToken. invalid_params Invalid parameters specified in the request. (Unknown parameters should be safely ignored for future compatibility). For example, return this if the client called action=unknown or user=. device_config_error Date/Time (or some other settings) is wrong on the device side. User needs to go (to device internal website) and configure device settings. offline The device is currently offline and can’t talk to the server. server_error Server error during registration process. invalid_x_privet_token X-Privet-Token is invalid or empty in the request. The device MUST stop exposing the /privet/register API after registration has been successfully completed. If the device is not exposing the /privet/register API, it MUST return HTTP 404 error. Therefore, if a device is already registered, calling this API MUST return 404. If the X-Privet-Token header is missing, the device MUST return HTTP 400 error. When the device receives the /accesstoken API call, it should call the server to retrieve the access token for the given user and return the token to the client. The client will then use the access token to access this device through the cloud. Cloud Print devices MUST pass the value of the "proximity_token" object in the response to local /privet/accesstoken API calls. It is more advantageous (future-proof) if the device can pass ALL parameters (including ones that are not described in this spec). user Email of the user who intended to use this access token. May be empty in the request. user string Same user as in input parameter. expires_in int Number of seconds until this token expires. Received from the server and passed in this response. offline Device is currently offline and can’t talk to the server. access_denied Insufficient rights. Access denied. The device should return this error when the request has been explicitly denied by the server. invalid_params Invalid parameters specified in the request. (Unknown parameters should be safely ignored for future compatibility). For example, if client called /accesstoken?user= or /accesstoken. If the device is not exposing the /privet/accesstoken API, it MUST return HTTP 404 error. If the X-Privet-Token header is missing, the device MUST return HTTP 400 error. When the device receives /capabilities API call, if the device is able, it SHOULD contact the server to get updated capabilities. 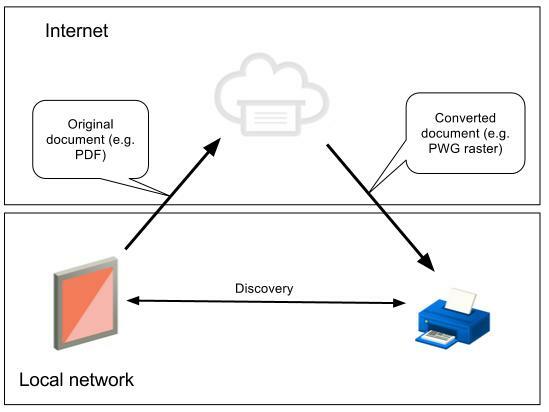 For example, if a printer supports posting a print job (received locally) to itself through the Cloud Print service, it should return capabilities that the Cloud Print service would return. Cloud Print in this case may alter the original printer capabilities by adding new features it may perform before sending job to the printer. The most common case is a list of supported document types. 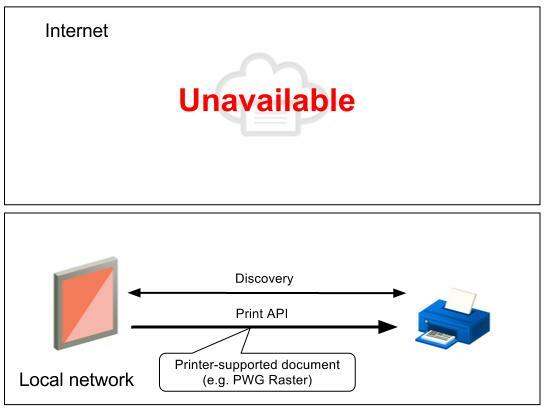 If the printer is offline, it should return document types it supports. However, if the printer is online and registered with Cloud Print it MUST return "*/*" as one of the supported types. The Cloud Print service will perform the necessary conversion in this case. For offline printing, the printer MUST support at least the "image/pwg-raster" format. offline (optional) Can only be "offline=1". In this case the device should return capabilities for offline use (if they are different from "online" capabilities). Note: Printers express supported content type priority using order. For example, in the samples above, the printer specifies that it prefers "application/pdf" data over "image/pwg-raster" and "image/jpeg". Clients should respect printer prioritization if possible (see the CDD document for details). If the device is not exposing the /privet/capabilities API, it MUST return HTTP 404 error. If the X-Privet-Token header is missing, the device MUST return HTTP 400 error. description string (optional) Human readable description of the error. server_api string (optional) In case of server error, this field contains the server API that failed. server_code int (optional) In case of server error, this field contains that error code that the server returned. server_http_code int (optional) In case of server HTTP error, this field contains HTTP error code server returned. timeout int (optional) Number of seconds for client to wait before retrying (for recoverable errors only). Client MUST randomize actual timeout from this value to a value that is + 20%. All APIs MUST return HTTP 400 error if X-Privet-Token header is missing. In some cases a client may need to send a document locally. It may be needed when client does not have a Google ID or is unable to talk to the Cloud Print server. In such case, the print job will be submitted locally to the printer. The printer, in turn, will use the Cloud Print service for job queueing and conversion. The printer will re-post the job submitted locally to the Cloud Print service and then request it, since it was submitted through the cloud. This process will provide a flexible user experience in terms of service (conversion) and print job management/tracking. In some cases a completely offline solution is desired. Since printers support a limited number of input formats, a client will need to convert documents to a few natively supported printer formats. There are two ways a client may initiate printing over the local network. Simple printing - client sends the document over the local network to /submitdoc API (without specifying the job_id parameter). The submitted document will be printed using default print ticket settings and no print job statuses are needed. If the printer ONLY supports this type of printing, it MUST advertise ONLY /submitdoc API in the /privet/info API response. Advanced printing - client should first create a print job on the printer by calling the /privet/printer/createjob API with a valid CJT job ticket in the request. The printer MUST store the print ticket in memory and return a job_id back to the client. Then the client will call the /printer/submitdoc API and specify the previously received job_id. At that time the printer will start printing. The client will poll the printer for print job status by calling the /privet/printer/jobstate API. /createjob takes the first available spot in the queue. Job lifetime (in the queue) is at least 5 minutes. If all spots in the queue are taken, then the oldest, non-printing job shall be removed and a new one will be placed there. If there is a print job currently printing on the device (simple or advanced printing), /submitdoc should return status busy and propose a timeout to retry this print job. If /submitdoc refers to a job that has been removed from the queue (due to replacement or timeout), the printer should return an error invalid_print_job and the client will retry the process from the /createjob step. The client MUST wait for a random timeout period of up to 5 seconds before retrying. If memory constraints prevent storing multiple pending jobs on the device, it is possible to have a queue of 1 print job long. It should still follow the same protocol as above. After a job has completed or failed with an error, the printer should store information about the job’s status for at least 5 minutes. The queue size for storing completed job statuses should be at least 10. If there are more job statuses that need to be stored, the oldest one may be removed from the queue before the 5 minute timeout. Note: For now clients will poll for job status. In the future, we may require the printer to send TXT DNS notification when ANY print job status has changed. When receiving /privet/printer/createjob API call, the printer MUST create a new print job ID, store the received print ticket in the CJT format, and return print job id back to the client. /privet/printer/createjob API has no input parameters in URL. The request body should contain the print job ticket data in CJT format. job_id string ID of the newly created print job. expires_in int Number of seconds this print job is valid. invalid_ticket Submitted print ticket is invalid. printer_busy Printer is busy and can’t currently process /createjob. Retry after timeout. printer_error Printer is in error state and requires user interaction to fix it. Description should contain more detailed explanation (e.g. "Paper jam in Tray 1"). If device is not exposing /privet/printer/createjob it MUST return HTTP 404 error. If X-Privet-Token header is missing, the device MUST return HTTP 400 error. 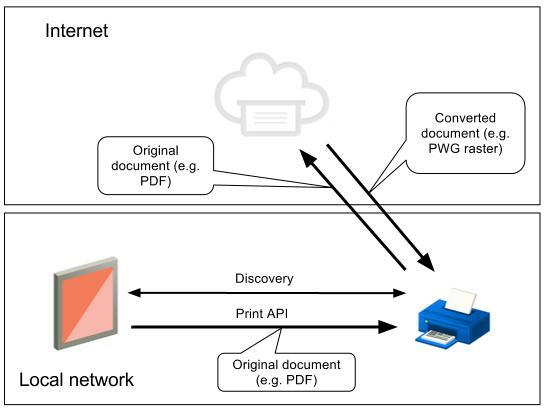 When receiving the /privet/printer/submitdoc API call, the printer should start printing. If it is unable to begin printing, it MUST return the error printer_busy and a recommended timeout period for the client to wait before trying again. Submitting a document to the printer may take a significant amount of time. The client should be able to check the state of the printer and job (advanced printing) while printing is in progress. In order to do that, the printer MUST allow the client to call the /privet/info and /privet/printer/jobstate APIs while processing /privet/printer/submitdoc API calls. It is recommended for all clients to start a new thread to execute the /privet/printer/submitdoc API call, so that the main thread can use the /privet/info and /privet/printer/jobstate APIs to check printer and job states. Note: Upon completion or abortion of the local print job, it is strongly recommended (and will be required in a future version of this spec) to report the final state of the job to the /cloudprint/submit interface for accounting and user experience purposes. The parameters "printerid", "title", "contentType" and "final_semantic_state" (in PrintJobState format) are required, and the parameters "tag" (repeated parameter) and "ticket" (the ticket of the job in CloudJobTicket format). Note that the provided PrintJobState must actually be final, i.e. its type must be DONE or ABORTED, and a cause must be provided in the case that it is ABORTED (see JobState for details). Also note that this use of the /cloudprint/submit interface to report local print jobs is not mentioned in its specification because that section is intended to describe the interface's primary use: submitting a print job with the document to print provided in the "content" parameter. job_id (optional) Print job id. May be omitted for simple printing case (see above). Must match the one returned by the printer. user_name (optional) Human readable user name. This is not definitive, and should only be used for print job annotations. If job is re-posted to the Cloud Print service this string should be attached to the Cloud Print job. client_name (optional) Name of the client application making this request. For display purposes only. If job is re-posted to the Cloud Print service this string should be attached to the Cloud Print job. job_name (optional) Name of the print job to be recorded. If job is re-posted to the Cloud Print service this string should be attached to the Cloud Print job. offline (optional) Could only be "offline=1". In this case printer should only try printing offline (no re-post to Cloud Print server). Request body should contain a valid document for printing. "Content-Length" should include the correct length of the request. "Content-Type" header should be set to document MIME type and match one of the types in the CDD (unless CDD specifies "*/*"). Clients are HIGHLY recommended to provide a valid user name (or email), a client name and a job name with this request. Those fields are only used in UIs to improve user experience. job_id string ID of the newly created print job (simple printing) or job_id specified in the request (advanced printing). job_type string Content-type of the submitted document. job_size int 64 bit Size of the print data in bytes. job_name string (optional) Same job name as in input (if any). invalid_print_job Invalid/expired job id is specified in the request. Retry after timeout. invalid_document_type Document MIME-type is not supported by the printer. invalid_document Submitted document is invalid. document_too_large Document exceeds maximum size allowed. printer_busy Printer is busy and can’t currently process document. Retry after timeout. user_cancel User explicitly cancelled printing process from the device. server_error Posting document to Cloud Print has failed. If the device is not exposing /privet/printer/submitdoc, it MUST return HTTP 404 error. If the X-Privet-Token header is missing, the device MUST return HTTP 400 error. Note: /privet/printer/submitdoc API may require special handling on printer side (because of the large payload attached). In some cases (depends on the printer HTTP server implementation and platform), printer may close socket BEFORE returning HTTP error. In other, printer may return 503 error (instead of Privet error). Printers SHOULD try as much as possible to return Privet. However, every client implementing Privet specification SHOULD be able to handle socket close (no HTTP error) and 503 HTTP error cases for /privet/printer/submitdoc API. In this case, client SHOULD handle it as a Privet "printer_busy" error with "timeout" set to 15 seconds. To avoid infinite retries, client may stop retrying after a reasonable number of attempts (for example, 3). When receiving a /privet/printer/jobstate API call, a printer should return the status of the requested print job or invalid_print_job error. job_id Print job ID to return status for. job_id string Print job id there status information is for. state string draft - print job has been created on the device (no /privet/printer/submitdoc calls have been received yet). queued - print job has been received and queued, but printing has not started yet. in_progress - print job is in the progress of printing. stopped - print job has been paused, but can be restarted manually or automatically. done - print job is done. aborted - print job failed. description string (optional) Human readable description of the print job status. Should include additional information if state< is stopped or aborted. The semantic_state field usually provides better and more meaningful description to the client. job_type string (optional) Content-type of the submitted document. job_size int 64 bit (optional) Size of the print data in bytes. server_job_id string (optional) ID of the job returned from the server (if job has been posted to Cloud Print service). Omitted for offline printing. semantic_state JSON (optional) Semantic state of the job in PrintJobState format. invalid_print_job Invalid/expired job ID is specified in the request. server_error Getting print job status (for print jobs posted to Cloud Print) has failed. If device is not exposing /privet/printer/jobstate, it MUST return HTTP 404 error. If the X-Privet-Token header is missing, the device MUST return HTTP 400 error. This section will explain the default behavior we expect from ALL Privet-compatible devices. Out-of-the-box devices should support only /privet/info and /privet/register APIs. All other APIs (e.g. /privet/accesstoken, local printing) should be disabled. Registration requires physical interaction with a device. User MUST take a physical action on the device (e.g., pressing a button) to confirm their access to the device. After the user takes the action noted above, the printer should send the /cloudprint/register request. It should not send this request until after the action is taken (see Sequence Diagram 1). If the device is processing a /privet/register request (for instance, waiting on the action above), it must reject all other /privet/register requests. The device MUST return the device_busy error in this case. The device should timeout any /register request that does not receive the physical action mentioned above within 60 seconds. The device MUST return the confirmation_timeout error in this case. The printer might flash a light or its screen to indicate that the user needs to take an action to confirm registration. what is happening if s/he didn’t trigger the request. In addition to a physical action to confirm from the printer (e.g., ‘Press the OK button’), a printer may also offer the user a button to cancel the request (e.g., ‘Press Cancel to reject’). This would allow users who did not trigger the registration request to cancel it before the 60 second timeout. The device MUST return the user_cancel error in this case. The device may be deleted explicitly from the Cloud service. 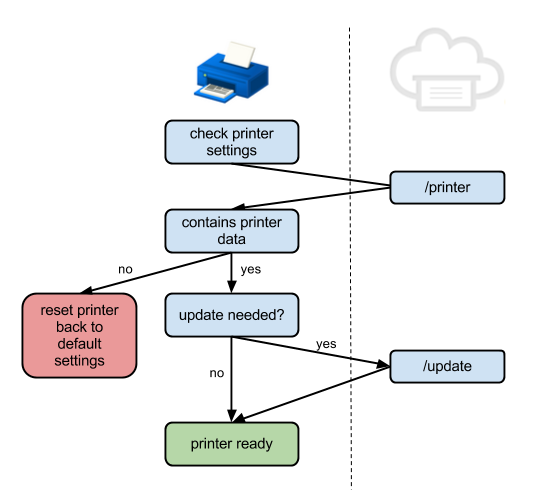 If the device receives success, but no device description as a result of /cloudprint/printer (for GCP) call, it MUST revert to default (out-of-the-box) mode. If the device’s credentials no longer work (explicitly because of "invalid credentials" response from the server), it MUST revert to default (out-of-the-box) mode. Local factory reset MUST clear device’s credentials and set it to default state. Optional: The device may provide a menu item to clear credentials and put it into default mode. 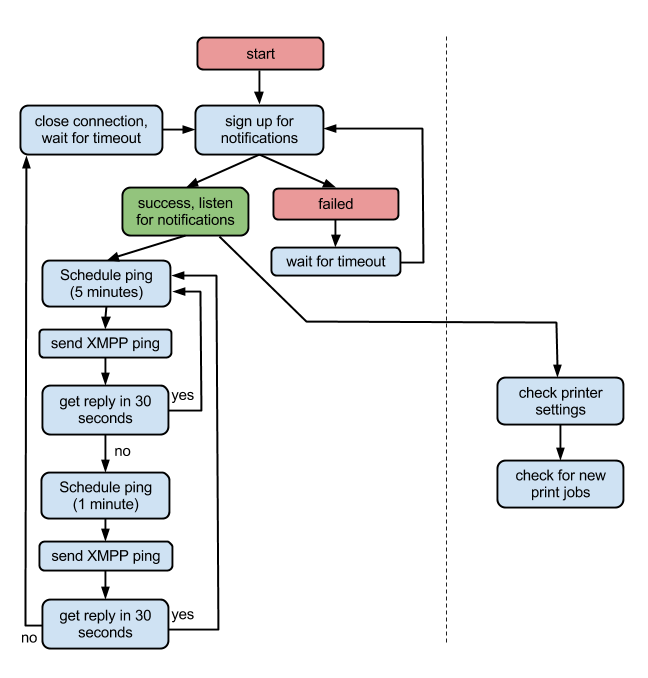 Devices supporting XMPP notifications MUST include the ability to ping the server. The ping timeout MUST be controllable from the server through "local_settings". The device may explicitly ping the server (/cloudprint/printer API for GCP, in addition to XMPP pings) no more often than once a day (24 hours) to make sure they are in sync. It is recommended to randomize the check window within 24-32 hour window. Optional: For Cloud Print devices, it is recommended but not required to have a manual way (button) to allow the user to initiate a check for new print jobs from the device. Some printers already have this. Optional. Enterprise printers may have an option to disable local discovery completely. In such case, the device MUST update these local settings on the server. New local settings MUST be empty (setting "local_discovery" to "false", means that it can be re-enabled from the GCP Service). This section will explain the possibility of XSSI and XSRF attacks on the device and how to protect from them (including token generation techniques). Without protection, malicious websites would be able to execute API calls and access results. To prevent this type of attack, ALL Privet API calls MUST require the "X-Privet-Token" header in the request. "src=<api>" script tags are not able to add headers, effectively guarding against this type of attack. It is possible for a malicious website to guess the IP address and port number of a Privet-compatible device and try to call Privet API using an <iframe>, forms, or some other cross-website loading mechanism. Attackers would not be able to access the results of the request, but if the request would perform an action (e.g. printing), they could trigger it. All other APIs MUST check for a valid x-privet-token in "X-Privet-Token" header. x-privet-token SHOULD be valid for only 24 hours. Even if an attacker is able to execute the /privet/info API, they would not be able to read x-privet-token from the response and therefore would not be able to call any other API. issue_timecounter is a number of seconds since some event (epoch for timestamp) or device boot time (for CPU counters). issue_timecounter is constantly increasing when the device is up and running (see token verification below). device_secret - secret specific to the device. Device secret MUST be updated on every restart. The device is not required to store all of the XSRF tokens it has issued. When the device needs to verify a XSRF token for validity, it should base64-decode the token. Get the issue_timecounter from the second half (cleartext), and try to produce SHA1 hash of device_secret + DELIMITER + issue_timecounter where issue_timecounter is from the token. If the newly generated SHA1 matches the one in the token, device must now check if the issue_timecounter is within the validity period from (24 hours) of the current time counter. To do so, device takes the current time counter (CPU counter for example) and subtracts issue_timecounter from it. The result MUST be the number of seconds since token issue. Important: This is the recommended way to implement XSRF protection. Clients of the Privet specification shall not try to understand XSRF token, instead they shall treat is as a blackbox. 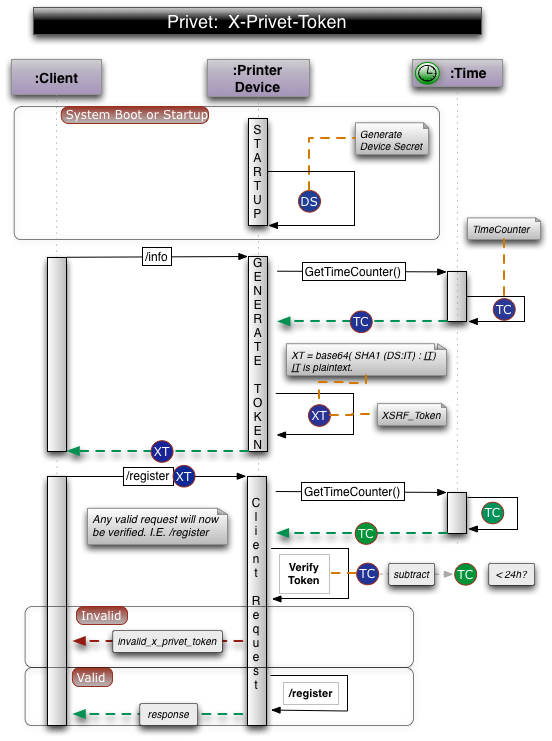 Figure 6.2.3 illustrates a recommended way to implement the X-Privet-Token and verification of a typical request. This section will illustrate a workflow in different cases.